Ivorian striker Didier Drogba says it would be an honour to win the 2009 African Player of the Year award after ending his feud with Caf. The Chelsea ace fell out with Africa's governing body after he refused to travel for the 2007 event and the award was given to Frederic Kanoute. He removed himself from contention for future African awards but has been named in this year's final shortlist. Drogba says the disagreement with Caf has been resolved after a meeting. "That was the past," said Drogba, who had a meeting with Caf president Issa Hayatou over the stand-off. "We all sat down and spoke about it, Mr. Hayatou and the people from the Ivory Coast Federation, so I think everything is good now." Drogba, who won the award in 2006, will line up against his Chelsea team-mate Michael Essien of Ghana and Cameroon's Samuel Eto'o for the 2009 award with Caf still insisting on nominees attending the ceremony. 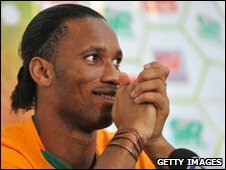 But the Ivorian forward Drogba is excited by the chance to win the award for a second time after helping his country qualify for the World Cup in South Africa. "It is a good trophy and a big honour for a player to win it," Drogba said. "Especially this year, which is so special for the African continent. To win it would be very nice." The 2009 Caf Awards, which also include the African team of the year, will be chosen by a vote of Africa's national coaches and announced in Ghana on 11 March.